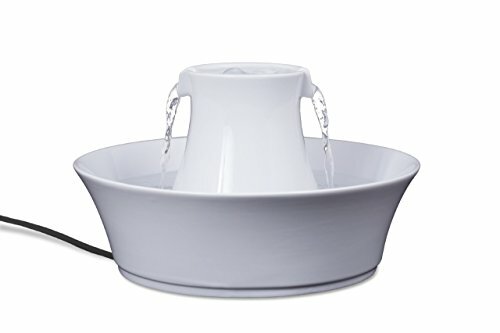 What Is The Best Cat Water Fountain For My Thirsty Cat? A cat water fountain dispenses running fresh water for your cat to drink. The water in a water fountain has been filtered and aerated as opposed to the water in a cat bowl, which is still and prone to becoming stagnant quickly. There are countless cute videos online of cats drinking from faucets. There is a reason they like to do that and it is because in nature, running water signifies that the water is fresh and safe to drink. A water fountain mimics fresh running water that may be encountered in nature. Cats have a very good sense of smell and water that is left sitting in a bowl will not smell fresh to kitty and it is likely that kitty will turn her nose up at that water. ​Water in a bowl needs to be refreshed daily or at each mealtime. ​ This is actually quite time consuming ​when put into practice. Why Get A Cat Water Fountain? Are cat water fountains noisy? My cat doesn’t seem to be drinking much. What are cat fountains made from? What about cleaning cat water fountains? What is the scum on top of the water? Cats prefer running, clear water as it signals that the water is fresh. Cats often drink from faucets or fish ponds and other water sources other than a water dish. Some tap water can have a strong smell of chlorine. Automatic cat water fountains have a pump which makes sure that the water is constantly circulating. Water fountains hold a fair amount to water, far more than the average pet bowl. One of the the Catit fountains holds 3L or 101 fl oz and the PetSafe Drinkwell Platinum Fountain holds a massive 5L or 168oz. This is a useful feature if you are going away for a couple of days. Cats, particularly older cats can be prone to dehydration, a symptom of many diseases found in older cats. 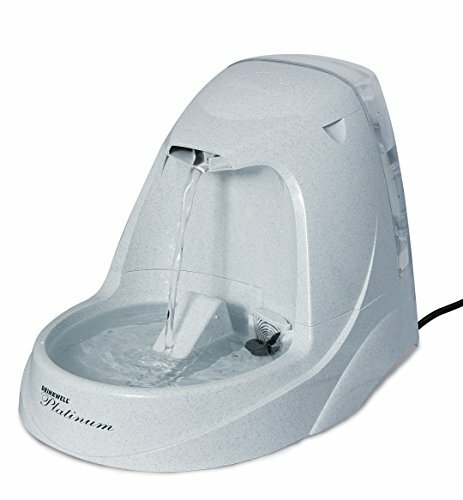 Elderly cats or cats with arthritis would benefit from a water fountain that has a higher base. This will eliminate need to bend almost right to the ground to drink. Cats with poor eyesight or are blind will benefit from hearing the running water, making it easier for them to navigate to the water fountain. 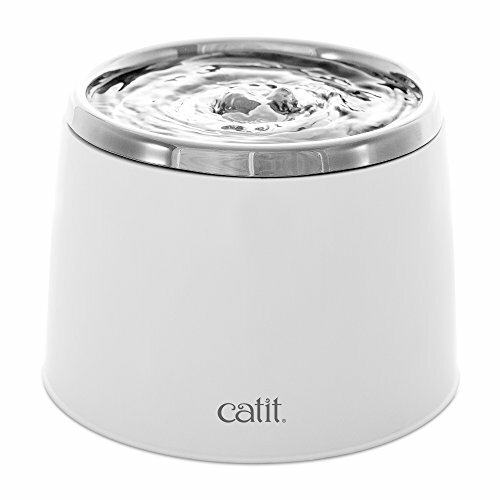 The video below shows the unboxing and setup of one of the super popular cat water fountains, the Catit Flower Fountain. It is easy to get up and running and it is so darn cute as the guy in the video mentions. The video shows the unboxing of the water fountain and how to put it all together. There is nothing left out in the video so you are not left with that feeling of, 'it’s not explained clearly' or 'I can't see what he is doing properly'. It is very easy to assemble and literally ready to use in minutes. Decide beforehand where you are going to situate the water fountain as it needs to be near a power source. You may not have to do anything at all to get kitty to use the fountain. Kitty may just start using the fountain as if it has always been there and this mostly seems to be the case. ​The thing with cats is that they are unpredictable and we know that, so we have to get smart and make some kitty anticipations, all for the good of kitty of course. Bearing this in mind there are some ideas here if kitty needs a bit of a helping hand to use his brand spanking new water fountain. Locate the fountain away from litter boxes or food bowls. If food gets in to the water fountain it is not going to be good and water in the cat food will be equally non desirable, so keep the food and the water apart. While still on location, make sure that kitty has enough room to navigate around the fountain ​easily. Be wary of placing it somewhere where it could easily be knocked over. The ceramic fountains are heavier than the plastic fountains so there is less chance of them being overturned. Mind you most kitties do not overturn fountains but there's always an exception to the rule and that includes an inquisitive toddler. This gives kitty a chance to get used to the fountain being around - you know doing the politely ignoring thing that cats are so good at. Next, turn it on from time to time on a low setting so that it is a gradual introduction, as all fountains will make some noise, even if is just a running water noise. Increase the setting over time but don’t rush. You will be able to judge how quickly your kitty gets used to the fountain and then, hey presto, starts using the fountain. Although we have suggested locating the fountain away from food, in these early days try placing some kitty treats near the fountain. It might just be enough of a temptation for kitty to try the fountain as he now in the vicinity. Some kitties start drinking from the fountain right away and don't need this gentle introduction. At this time you may want to remove the normal drinking source but play this by ear, kitty may not be ready for the fountain just yet. Sometimes a fountain will become noisy over time. This is usually because the pump needs cleaning or the water level has become too low. Make sure that the water level is always topped up above the minimum line. With normal use, the noise of the fountain does not appear to be a problem. Generally speaking ceramic fountains tend to be less noisy than plastic fountains. Does your kitty eat wet food? If so, your kitty may not drink as much as you would expect because of the added water in the food. Maybe your cat has found another water source that you are unaware of. Otherwise it may be a medical issue and a trip to the vet would be advised. Some kitties like to swipe at the water so make sure no precious artefacts are near the fountain. Cat water fountains are either plastic, ceramic or stainless steel. Some spcts may be plastic, for example the pump. Ideally the the pump would be mae from BPA free plastic. Ceramic and stainless steel fountains can be put into the dishwasher. Always check the manufacturer recommendations as some will say to use the top shelf of the dishwasher. Any plastic components such as the pump need to be cleaned by hand. Some products have a cleaning kit that is designed specifically for the product. You may have something at home already, that is effective for cleaning. We bought some brushes for cleaning baby bottles and found they were quite useful for cleaning all sorts of things and can really get into nooks and crannies. All products gave instructions for cleaning plus cleaning and maintenance for the pump to ensure that it continues to work for a long time. Cleaning the fountain, maintaining the pump and changing the filters may seem like a nuisance but it is something that needs to be done regularly to ensure that your product has a long life. Sometimes cat (and dog) owners report that scum or froth appears in the water reservoir in the water fountain. It appears that the problem is caused by saliva when your pet or pets are drinking. It stands to reason that some animals including dogs will produce more saliva hence the froth in the bowl. This applies to all fountains, plastic, ceramic and stainless steel. Bio-film forms on the surface of water and looks like a scummy film on top of the water. You may have seen this on the surface of a pond. This is also evident in bowls of water not just water fountains. There is more information here about bio-film in the environment. Ensure that all cleaning procedures suggested by the manufacturer are followed to keep the fountain in tip top shape. This fountain has three different water flow settings – a gentle water flow, a bubbling top and calm streams. Calm streams are shown in the image. You may need to experiment to find the setting that your cat prefers. The water reservoir is 100 fl oz or 3 litres which is a large capacity for a cat drinking fountain. It comes with dual action water softening filters that are specific to the product. The filters last for approximately 30 days and then the filtration effects will start to decrease and the filters will need to be replaced. The filter removes magnesium and calcium from tap water and also removes chlorine odors. It needs be plugged in so consider the the length of the power cord. The cord is 42 inches. It is made from BPA free materials and has a two year warranty. The manufacturer recommends that the product be washed before assembly. Here is a video that shows how to do that. Clean the fountain using warm water, a sponge and soap. Don’t use any abrasive cleaners or scourers. Black sediment can sometimes leak from the filter. This is carbon. It can be prevented by rinsing the filter thoroughly. This fountain is made from BPA free plastic. There is more information about BPA here. It has a capacity of 168 ounces or almost 5 liters. That is a very large capacity. Being away from the home in the heat of the day or just being away from home all day, it is reassuring to know that there is ample running water for your pet. The power cord is approximately 5 1/2 ft. The fountain has a free falling water stream as shown in the photo as well as a reservoir at the bottom. Cats that are partial to drinking from a faucet would like this fountain. As with other fountains a filter is included with the original purchase and replacement filters can be purchased online. If the pump stops working the most likely cause is that it needs disassembling and cleaning. If not, replacement pumps are available. This fountain (pump excluded) can also go in the top shelf of the dishwasher – not an essential element but very handy. One of the great features of this cat water fountain is that it has different height water levels so if you have more than one cat they can quite comfortably be drinking from the fountain at the same time. It would also be suitable for a small dog. It is approximately 7″ high at its tallest point and 8″ wide. The water reservoir is 3″ high. The bowls are dishwasher safe. One of the most important pieces of advice with looking after this fountain is to read the manual. I know that can be trying for some of us (why is that?) but it is worthwhile spending those minutes relaxing with a coffee before bolting at the gate and assembling it all without really knowing how to clean and care for the unit. The instructions indicate that the filter should be changed monthly. The pump should be quiet. If it starts to become noisy the water level may be getting too low and it will need topping up. It has a wide base to keep it from being knocked over. It needs to be near an electrical outlet but does have a reasonably long cord at 10ft. If you live in a hard water area the pump may need to be cleaned every few weeks. There are no special tools required to clean or disassemble the pump. This fountain has a three year guarantee. The pump has a one year guarantee. The capacity is 70 fl oz. This is a good reliable product. This is a large fountain so if you are thinking of a fountain for the dog and the cat this could be a good choice. It is 100 ounces or approximately 2.9 liters and as you can see from the photo it is multi tiered so suitable for animals of different sizes. The different levels also mean easy access for elderly or arthritic cats. The fact that this fountain (removing the pump first ) goes in the top shelf of the dishwasher is a big plus because it just makes life easier. It easily separates into two parts for easy cleaning. The fountain is made from plastic and is BPA free. There is a replaceable carbon filter which helps to keep the water fresh. On some hard floor surfaces the fountain may need a mat placed underneath to absorb any sound. Customer care is US based, six days a week which is about as good as it gets. This is an extremely popular product at and is currently (March 2018) at a very competitive price – definitely worth checking. This is a very smart streamlined looking fountain. It is ceramic and comes in four different colors, red, white, taupe and blue. This fountain has a 70 oz capacity and has an upper and lower dish as can be seen in the photo, so more than one animal can use the fountain at the same time. The fountain is able to go into the top rack of the dishwasher, minus the pump. It is quick to disassemble which makes it quick and convenient to clean the fountain thoroughly. 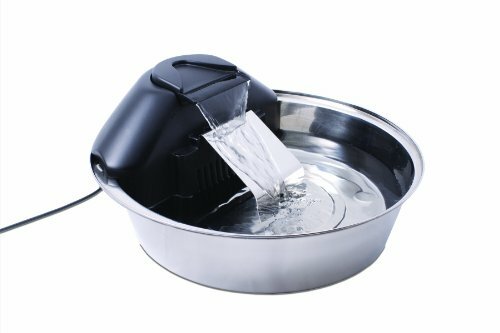 The pump recirculates the water and the filter removes any cat hair from the water plus odors and bad tastes. Like other cat water fountains a replaceable carbon filter will need to be changed. You can expect to change the filter approximately monthly however if more than one cat is using the fountains the filter may need to be changed more often. The activated carbon absorbs some water contaminants, as well as chlorine from tap water. This improves the taste and remove odors from drinking water. The product is not manufactured in the US however the customer care is US based and the call center is operational six days a week. 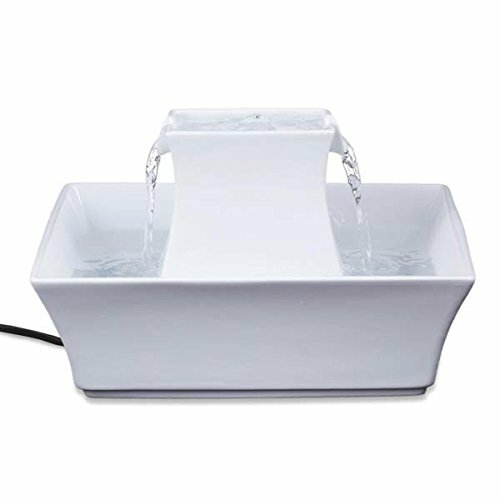 Ceramic water fountains are an attractive part of home decor and also fulfill a practical function, fresh and continuous drinking water for the cat. Choosing a color will depend on your decor. Normally I would probably choose white but I really love the blue fountain. There are two levels to drink from in this fountain. In addition, the top level has two water streams and a small reservoir as indicated in the photo. This is a useful feature if you have more than one cat. The capacity is 70 oz. 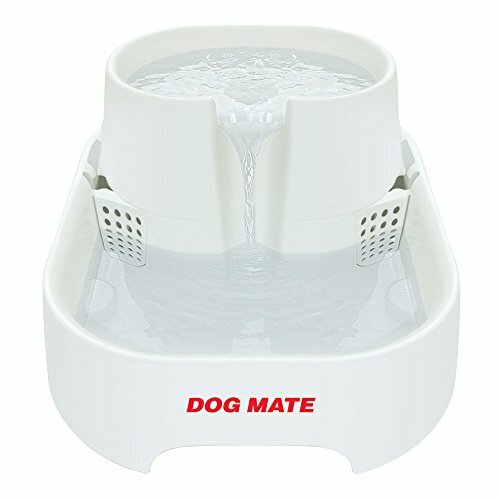 This is another PetSafe product and is mechanically the same as the pagoda fountain, it is just a different shape. Like all water fountains this one will need cleaning as definitely sludge can build up on the filter. 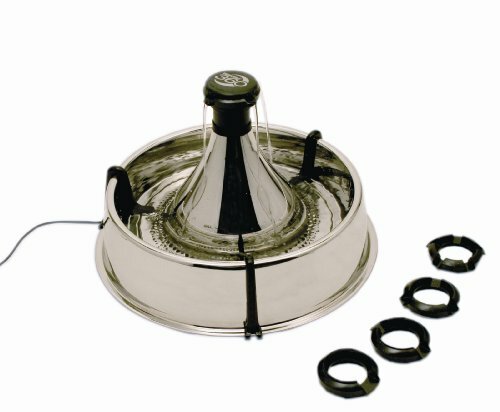 This fountain is easy to disassemble for cleaning so that is a plus and the filters are replaceable and available online. It is easy to clean and as with all other fountains it is a matter of removing the pump and cleaning the pump. The fountain can go in the dishwasher if desired. Depending on how hard the water is in your area will also have a bearing on how often the filter needs cleaning or if a filter is required at all. The filter does need to be rinsed before use, otherwise charcoal like black deposits will show up in the fountain. This is a sleek design and the fountain is available in red or white. This is another quiet water fountain, an important consideration if your cat is easily startled. It is suitable for cats and dogs but realistically, small dogs to mid size dogs. The capacity is 71 ounces or 2.1L. 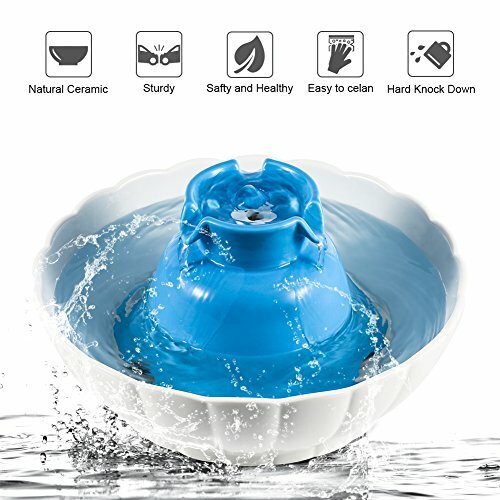 This fountain is ceramic and any plastic components such as the pump are BPA free plastic. There are three different ways in which the water is dispensed. The water gently bubbles in the reservoir at the top, the water also cascades from three different areas into the larger reservoir at the bottom of the fountain. If you have the space, don’t place the fountain right up against a wall. Ensure that there is 360 degrees access to allow your cat or cats to approach the fountain from any side.. The fountain is a very attractive blue and white and weighs 6.17lbs. The pump and accessories should be cleaned by hand however the ceramic part of the fountain can go in the dishwasher as with other ceramic fountains. The replacement filters are available online. The pump can be taken apart if necessary and cleaned if it stops working. 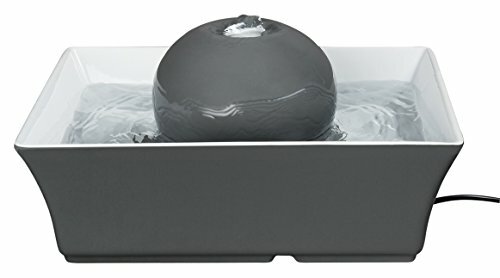 PetSafe Drinkwell Seascape Ceramic Dog and Cat Water Fountain, Gray, 70 oz. 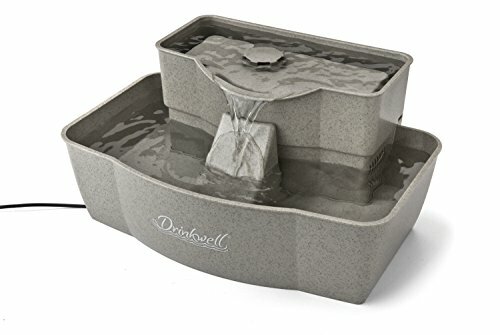 This gray ceramic fountain provides 70 ounces of fresh, aerated, circulating water. The flow of water is quiet, so it won’t scare your kitty cat or be annoyingly noisy. This noise the fountain makes does need to be a consideration if the water fountain is in a confined space or in a general living area. The great thing about ceramic is that it can go in the top shelf of the dishwasher (apart from any plastic components such as the pump) so already a plus plus for looking after it on a long term basis. Another plus with ceramic is the weight. Your cat or dog won’t knock this fountain over if they are inclined to knock over things as some cats are. As with other water fountains don’t be alarmed if you see any black residue in the fountain. It will be from the charcoal filter. There are instructions about rinsing the filter before use. Bear in mind that filters do need to be changed and replaced. The filter remove odors and bad taste and also small particle debris however they do not remove chemicals. Price wise this is comparable with other ceramic fountains. As this is a PetSafe product, customer service, call or email is 6 days a week and is based in the US. Over the years I have used plastic, ceramic and stainless steel feeding bowls and the one thing I like about stainless steel is that I always feel as though it is thoroughly clean. It is probably one of the reasons that stainless steel fittings are used extensively in commercial kitchens. This fountain is made from stainless steel and holds 60 oz or 1.77L of water. It has a charcoal filter which needs to be replaced once a month if you have one or two cats and more often if a number of cats use the fountain. One filter is included with purchase of the fountain and replacement filters are available online. The water comes out a slow and steady pace , it does not gush or splash and there is an adjustable slider so you can adjust the flow to suit. The fountain is easy to take part and with the exception of the pump it is safe use in the top shelf of the dishwasher. Some people have mentioned that if there is a problem with the pump such as the motor becoming noisier it is a good idea to take it all apart and do a clean of the motor as instructed. Here is a video that shows exactly where to place the filter and how to clean the pump. Even though this video is a few years old it still a very good demonstration with step by step instructions. 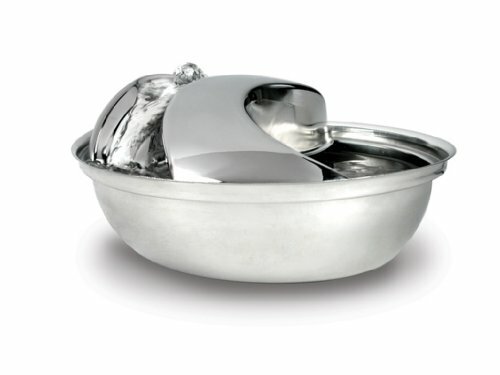 This is a larger capacity fountain holding 128 oz or 3.78L so is suitable for cats and dogs of all sizes. The 360 degree design means that the fountain can be accessed easily from all sides, once again handy if you are more than a one pet household. If this product looks familiar that is because PetSafe have the same design using ceramic. It has a replaceable carbon filter as is the case with other fountains and includes one filter. The filters can be purchased online in a pack of ten. The fountain has five different interchangeable spouts to create up to five individual streams and also has an adjustable flow cap to increase or decrease the water flow rate. This fountain is safe for the dishwasher (excluding the pump). If this fountain is your choice make sure to place it so that your cat can get around all sides of the fountain. This particularly makes sense if you have more than one cat. The video below is a good one to show the size of the fountain and how three cats use the fountain at the same time. The cats would have easier access to all of the fountain if it was moved away from the wall. The fountain has a stainless steel top as indicated by the name. It is not strictly stainless steel, it is only the top reservoir where the cat drinks from that is stainless steel. The white base of the unit, that you can see in the photo, is plastic. Make sure not to overfill this fountain otherwise it may leak. Most fountains have clear marking regarding the water fill line. Overfilling will lead to potential leaking and thinking there is something wrong with the product when it may be simply a case of too much water. The fill line isn’t immediately obvious so the best way to describe the maximum water fill line is, fill with water to the base of the stainless steel top or where there is a bump in the plastic at the same point. One really good point about this fountain is that it is a good height for elderly cats or cats with arthritis, they just don’t need to bend right over to get to the water. It has a 64 fl oz capacity. This fountains has a 128 fl oz capacity. It has a wide, water falling stream, that falls down a ramp. This provides greater access to the water and also reduces the splash and associated noise. The water flow is not adjustable in this fountain. Being stainless steel it is perfect for the top shelf of the dishwasher (excluding plastic components such as the pump and the filter). Customer care is US based by chat, call or email, six days a week. This is somewhat reassuring as often these days customer care can be difficult to connect with and ends up adding to any issue. The fountain is made in China as are most fountains. They are designed and tested in the US. The activated carbon filter which removes odors and bad tastes is replaceable online. For an elderly cat or cat with arthritis or other health issues we recommend a fountain that requires very little bending to reach the water. All of the Catit fountains are good in this regard. 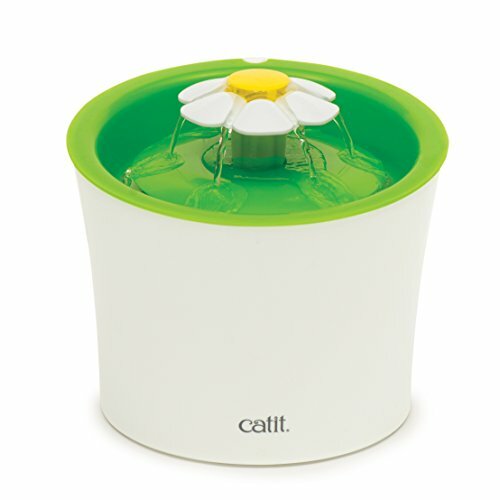 The Popular Catit Flower Cat Water Fountain has a capacity of 100fl oz, 3L. This gives peace of mind if you are leaving the house for some time or if it is a hot day. The Catit fountains have a two year limited warranty. You can register your product online for additional customer care. For more than one cat or a cat and doggy family it would definitely be a good idea to go for one of the larger capacity fountains. There are several large capacity fountains on the market however if you have more than one animal they need to be able to all able to use the fountain at the same time (even if they don't always do this). For this reason our choice is the PetSafe Drinkwell Multi-Tier Cat and Dog Water Fountain. It has a 100 fl oz capacity or 2.9 liters. Also being a PetSafe product there is the added assurance of US based customer care , six days a week. ​How do you know if you have chosen the best cat water fountain? Are you thinking of a plastic, ceramic or stainless steel cat water dispenser? Is your cat likely to push the bowl around? In this case a ceramic fountain is a good option. What capacity do you need? This will depend on how many animals are using the fountain. Think about the placement of the fountain and depending on the design make sure there is access to all sides of the fountain. Is there a power outlet near your chosen location? Giving some thought to these questions will ​enable you to make a choice based on the criteria that will suit your needs rather than just the appearance of a fountain. This will ensure you have the best cat water fountain​.